booking / News and blog / We are back! It has been a while since the last update of the captain's blog. This doesn’t mean though that we haven’t done anything in the recent months. On the contrary, these months were busy and special! We witnessed the finish of the Volvo Ocean race in Scheveningen, joined the Tall Ships Race from Stavanger to Harlingen and enjoyed great sailing in the Mediterranean to end with three weeks of maintenance in Tarragona, Spain. Hoisting the yards in 20 degrees is completely different from painting in between rain showers in the Netherlands in November! We are now on the way to the Canary Islands. Sailing through the Strait of Gibraltar; with a strong southern wind, turning west and turning after the passing of a cold front. Heavy swell and heavy showers. The crew hanging on the yard to replace a sail that was destroyed during the night. The sail lies on the deck just before the wind rises again to sweep over the ship with 40 knots. Sailors walking forward to reduce the topgallants. After ten minutes the wind will lie down again and a small bit of blue appears on the horizon. We are back on course to the south. 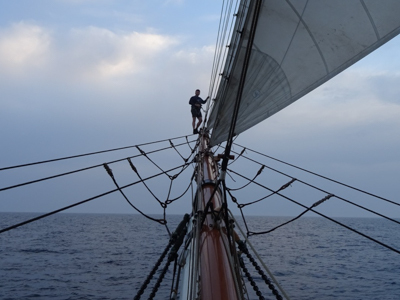 Between 2007 and 2012 Moritz sailed on the Stad Amsterdam already as the second officer for one year and as the first officer for four years. In June 2015 Moritz Kuhlenbäumer became one of the two captains on board.